Artists from many different cultures have found intellectual or sensitive ways and means of revealing depth or adding a sense of temporality to the bi-dimensional surface of a painting. I wish to examine how time can be made tangible in a picture without recourse to the successive images of a strip cartoon or to the slow unraveling of a historical or legendary event on an Oriental scroll. In theory, at one glance the eye sweeps the whole of a painting however large its actual size. The first perception is global and simultaneous, which doesnt mean that this rapid appraisal exhausts the works content. To give a sense of temporality in a figurative work, its possible to contrast the ephemeral with the durable as in my still life Blue Iris and Pink Seashell (1958). In one day the flower blooms and withers, whereas the seashell grows slowly and is made of solid material. In a broader way, all nature flows back and forth, nights alternating with days, sun with clouds, changing winds and seasons. I love the phenomena resulting from the interaction of elementary forces. I like to watch the processes, the fight of water and fire, the affrontment of wind, sea and cliff, all cosmic influences which bring fast or slow transformations, and I like to meditate on the tides within my own psyche, itself a part and an echo of this continuum. Cyclical Space in a Blue Key (1962), Like the Sound of Oars (1962) (illustrated on home page) and Origin (1963) are nautical cybernetic trajectories. In 1970, Lazy River and Mirror of Dreams evoke rather the stillness of fresh water or the flow of consciousness in the human mind reflecting nebulous daydreams. In 1987 The Truth of Dreams is distinct from my other concerns that same year and its genesis deserves retelling. One morning in 1944, I woke up from a dream with a pristine image of my friend Genevieve standing in front of a rock cliff so vividly etched in my mind that I sketched it right away in India ink on a small square sheet of paper. It was so present to my soul that I felt confident there would not be any problem in passing from the drawing to the oil. Much to my dismay, success eluded me though I tried my best more than ten times, approaching the venture with more pluck than luck. The features became too harsh, too clearly defined, or too contrasted, far from the mother of pearl tones and the milky dawn mood of my vision. I had to let go and apply myself to other projects, even forgetting the episode. Decades later, one afternoon while at work on The Red Cliff (1987) (illustrated on Color theme page) in California, I had a spontaneous flash of great intensity and knew that I was now able to realize the portrait I had to abandon in 1944. It is true that some projects are long to mature, but a delay of 43 years between the seed and its fruit is quite unusual. Back home the same evening, I looked for the original sketch that I had kept as a memento of an unfilled potentiality and as a sobering example of my limitations, and found it in a portfolio of old drawings. The next morning, still strongly motivated, I selected one of the square canvases from the assortment of different shapes and sizes I like to keep in reserve in my studio. In two days my vision became a realized picture on my easel. Rather enthused, I went on with three variations in other dimensions and with some alterations in the setting, but quite faithful to the overall feeling. They were all satisfactorily completed within a week. I find it mysterious to entertain a design for so long that it is all but forgotten, and all of a sudden apparently for no reason the whole project is reawakened and actualized without effort. In the Sephardic cabala tradition, it is said that the eye listens and the ear sees. As a rule, I never envision a complete mental image of my pictures before starting and I would find boring if I did. It is rather like the buzzing of a swarm of wild bees wandering in search of a hollow tree. It is an intensity, a vibrancy that quickens the heartbeat, an organic glow ascending toward the larynx as if to prompt the voice. But no sound is uttered. It is just a good time to select a canvas of a certain size from amongst those stacked together in waiting. Whether under the control of my will or not, when my abstract compositions reach a certain stage of completion they take on symbolic meaning. In my night sky, the Erratic Comets (1998), activate a Cosmic Disarray (1998). It enables me to reach the core of a flow of consciousness more and more remote from individualized emotions. Inexorably, all human beings run through the same trajectory from dawn when our dazzled eyes perceive for the first time the tiny world around our families, homes or countryside, to rise to the zenith at noon under the impulse of the hormones and sexuality. Later the energy becomes finer and more spiritualized until we acknowledge ourselves as mere particles in a tonality that draws us, with some fright and a measure of happiness, toward the unavoidable eclipses and all the avatars of the indefinite stellar night. The oriental mood of this river landscape was actually inspired by Shakespeare's tale of A Midsummer's Night Dream. 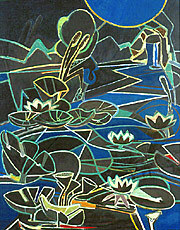 The water lilies are exaggerated in size to accelerate the perspective, forcing the composition to proceed and recede according to GilotÕs own rules. Among the more somber, moonlit tones, the vibrant blues and red clefts pertain to the action of the fable and provide stabilizing structure. 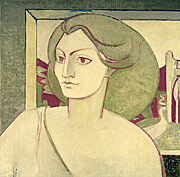 It was Gilot's intention that this composition would appear to be logical when, in fact, it is rather illogical, to echo the Shakespeare tale. Symbolically, lotuses and water lilies are said to induce dreams and visions, and the river can be conceived as a stream of consciousness. Personal interpretations of landscapes and seascapes are a reoccurring theme for Gilot. Typically, they are inspired by memories of childhood holidays with her family or charged with philosophical undercurrents in their representation and organization of space. In this work, painted primarily in half tones at her La Jolla studio, Gilot focuses the composition by calling upon masses and impasto to define the spaces and convey the spirit of the scene rather than strong colors and traditional perspective. Philosophically, Gilot wished to evoke the interaction of the four elements. The tide and cliff formations -- blue tones against gray  suggest the timeless struggle between earth and water. The sun floats in a sky of Ultramarine Yellow, a color often employed by Gilot to convey the color blue due to it cold chromatic properties. The final, invisible and ravishing agent of wind is manifested in the weathered textures of the cliffs and the turbulent blues of the sea. Continuing the theme of the Wanderer, Gilot abstractly explores the cosmic realm of these erratic trajectories, portraying these stellar, often prophetic, heavenly bodies as universal wanderers, plotting their own defiant parabolic orbit around the solar system.